Lucy was a very happy woman when we visited her in February, and so was her sow! Eight piglets had just been born and this meant that Lucy would be able to grow her business with the four female piglets whilst selling the males for meat when they were fully grown. Her animal rearing business which started with a loan in August 2014, has already helped her to expand the rice growing operation she had been running since 2012. Together the businesses are enabling her to provide proper food for her four children, three of whom are at primary school. Lucy is grateful to Mondo for the opportunity she was given when the local manager selected her for funding in 2012. She has always worked hard and has good ideas for expansion. 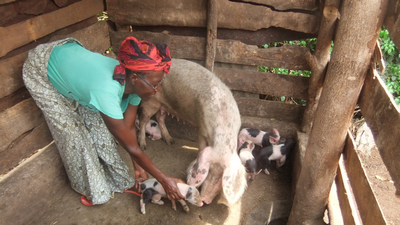 With the funds provided she built a pig sty and buys good quality feed for her animals. The future is bright for her and the family. If you would like to help support more women like Lucy, we are currently raising funds for our next round of grants and loans. To help us achieve our target you can donate here.